PREVIOUSLY ON... | On the heels of uncovering some seemingly latent romantic feelings for her adoptive brother, Deb walked in on Dexter murdering the season's Big Bad Travis. COMING UP NEXT | Early on, Dexter will (almost completely) come clean to his "sister" about his Dark Passenger. Also, look for the Bay Harbor Butcher to once again pique interests, while a mysterious new lady (played by Chuck's Yvonne Strahovski) catches Dex's eye. 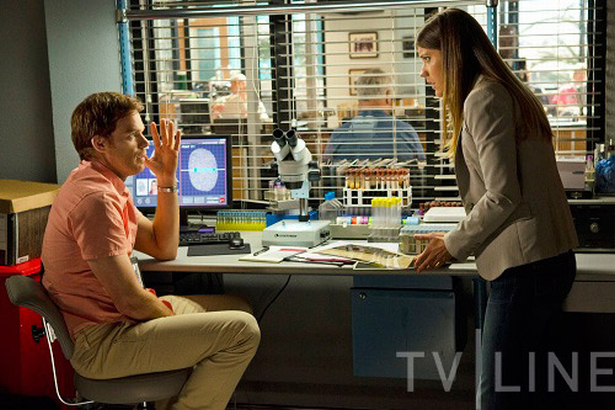 TVLINE BONUS SPOILER | In devious undercover intern news, Dexter is going to learn the hard way why it's so vital to password protect your computer.